Our mission is to empower individuals to achieve their goals through exceptional martial arts programs. We offer elite programs ranging from character development for kids, self defence and fitness for the whole family, and martial athlete competitive training. The Ottawa school was opened in September of 1999 and after 19 years of success continues to be a leader in the field. Now with multiple locations, K2 has grown into one of the largest martial arts operation in the region and looks to expand dramatically over the next decade. The chief instructors – Scott FitzPatrick, Aksell Nicolaides, and Alain Moussi all have over 25 years of martial arts experience earning high black belt ranks in multiple disciplines, accumulating many competitive titles as well as earning numerous industry awards and accolades. Most recently K2 received the 2017 School Excellence Award from MAIA – the world largest martial arts industry association. 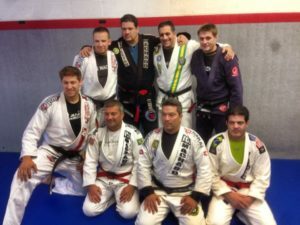 Always pursuing new achievements, Aksell, Scott, and Alain earned their Black Belt in Brazilian Jiu-Jitsu under the famed Machado brothers in 2013. K2 is truly unique in its relentless pursuit of excellence – spending more every year on it’s instructors’ education and personal development than most schools spend in a lifetime. Every year K2 instructors fly all over the world training and learning from the best in every field. Just this year K2 sent 13 instructors (all expenses paid) to Las Vegas to train at the world’s largest martial arts convention. K2 also invested in hundreds of consultation hours with some of the worlds most prominent martial arts, fitness, and personal development experts. This is in addition to the dozens of other key events team members attended all over the globe to bring back cutting edge knowledge and expertise. This unrelenting passion for always acquiring and delivering the absolute best to the thousands of individuals that come through our doors each year is what has made K2 so special. If you would like to see for yourself how K2 can positively impact your life, we invite you to register for our one of our trials.